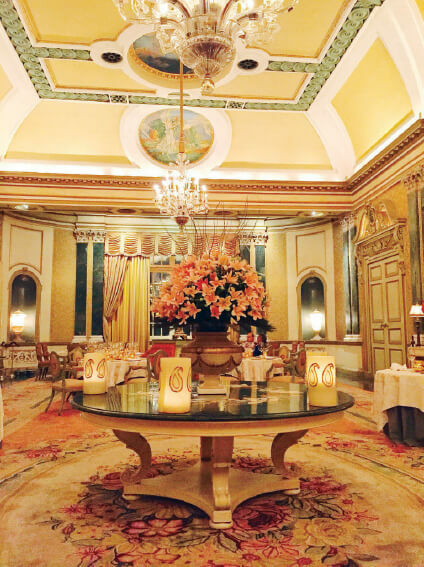 Rambagh Palace’s superlative restaurant, Suvarna Mahal. 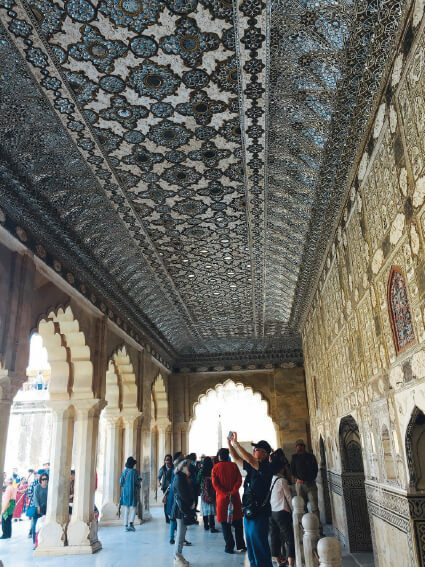 Intricate details abound at the Diwan-i-Khas, or Hall of Private Audience, at Amber Fort. At a glance, it is easy to see why Rajasthan is India’s most beguiling state, simply for the way it unabashedly panders to one’s preconceived notions of exoticism: everywhere you look, there is a magical palace or craggy hilltops dotted with thorny kikar and khejri trees, and which share space with shrines, herds of floppy-eared goats, proud peacocks, haughty camels or perhaps a majestic elephant. 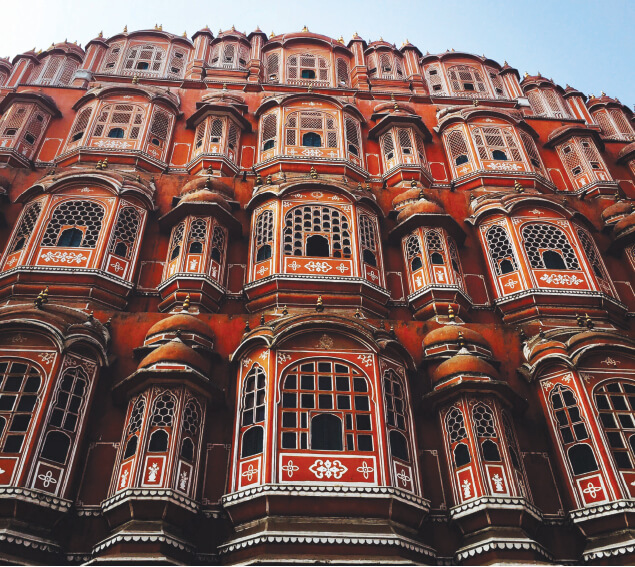 For the first-time visitor, famous sights — such as the spectacular Hawa Mahal (Palace of the Winds), with its intricate façade, and Amber Fort, perched on a hill promontory that juts into Maota Lake — are not to be missed. Meanwhile, the City Palace is a particular must for its treasures, which include a spectacular armoury and the two large sterling silver urns called gangajalis, said to be the largest of their kind in the world, with the capacity to hold 4,000 litres of holy water from the Ganges so that Maharaja Madho Singh II had enough for his personal use (for drinking as well as religious ceremonies) when he travelled to London in 1902 to attend the coronation of Edward VII. Nearby, standing in the middle of the glassy Man Sagar Lake is the Jal Mahal (Water Palace). Opened up to visitors in 2012, it is a lovely place to visit, not to peer at royal Jaipur treasures or marvel at Rajput architecture, but to wander around its splendid garden, modelled on the Persian-style quadrilateral char bagh layout, which was in turn inspired by the four gardens of Paradise mentioned in the Holy Koran. For those interested in astronomy, a visit to the Unesco World Heritage Site of Jantar Mantar is recommended for its collection of 19 architectural astronomical instruments, including the world’s largest stone sundial, the Samrat Yantra. All these were part of Maharaja Sawai Jai Singh II’s collection and make for a pleasant way to spend an afternoon. In between palace hopping, a spot of shopping is highly-recommended as Jaipur is populated by master craftsmen and dotted with stores selling everything from stunning gemstones and traditional kundan jewellery to glass bangles, embroidered clothes, gorgeous saris, beautiful pottery and lovely, fine, hand-printed paper and stationery materials. The renowned Amrapali jewellery brand hails from Jaipur, as does Anokhi, a lovely brand of textiles, home furnishings and clothing that blends block-printed motifs with contemporary design sensibilities. 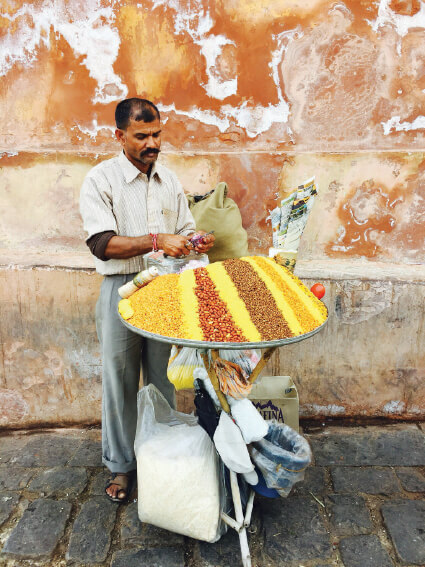 And considering that you are in India, a colourful street-shopping experience in one of Jaipur’s many labyrinthine bazaars is also positively experiential. Handicraft hunters make a beeline for the Chandpole Bazaar while textiles are best sourced from the Kishanpole Bazaar. For a bit of everything, Bapu Bazaar is your best bet. But even if you aren’t tempted by the shops, a giddy array of merchandise can as easily find its way to you. Near every monument, scores of peddlers would invariably lie in wait, hawking wonderful items from carved wooden elephants and embroidered parasols to the loveliest fans fashioned out of peacock feathers. A word of advice: if you are not interested, be firm and say so, lest things escalate into a spot of bother; but if you are keen, don’t forget to haggle. 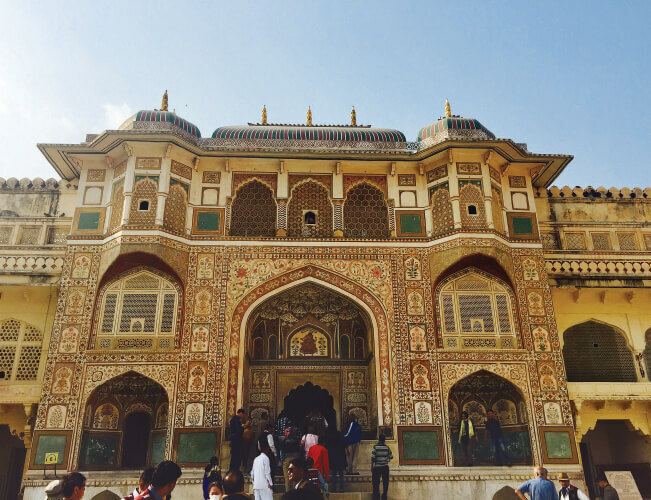 But as much as Jaipur is all about visiting beautiful palaces, few experiences can equal the thrill of actually staying in one. Certainly, given my fascination with Gayatri Devi, it is only fitting that Rambagh Palace, set in 47 acres of lush gardens, is my favourite. The preferred residence of her husband, Rambagh is not ancient, by any means. Built in 1835, it remained a royal residence until 1957 but continues to ooze elegance and grandeur from every brick and cornice. Although it remains the property of Jaipur’s royal family, Rambagh is run as a luxury hotel today by the famed Taj Hotels group. Even if you don’t spend the night here, it is well worth a visit, at least for dinner or drinks. The Suvarna Mahal restaurant, housed in the palace’s former banquet hall, boasts interiors conceptualised by Sir Anthony Millbank and a menu that spans four distinct regions: Rajasthan, Awadh (Lucknow), Punjab and Hyderabad. The modern touch that will capture your attention most would be the Medusa head-emblazoned flatware and cutlery, courtesy of — not the royal house of Jaipur — but the house of Versace. And what should one order amid such sumptuous surroundings? Everything — from the piquant tomato broth to the lamb biryani — is wonderful but don’t miss the fiery flavour afforded by a dish called laal maas, that hypnotic red meat curry so iconic of the state. Made with mutton, the punch comes courtesy of a handful of hot spices, primarily red Mathania chillies, although most chefs tend to temper the dish somewhat with the addition of rich, cooling yoghurt. As Rambagh is a little way out of town, another place to consider bedding down for the night in considerable style is the visually-delightful Samode Haveli, which is set within the historic walled city of Jaipur. Built almost two centuries ago as a residence for the aristocratic Samode family, the haveli (a traditional Indian mansion) is dotted with charming water pools, fountain courts and gardens, and remains a great favourite among those who appreciate history, heritage and regal-but-eccentric design. A third but no less beguiling option would be The Oberoi Rajvilas, set in a 32-acre landscaped oasis. Built around an 18th-century Shiva temple, The Oberoi Rajvilas perfectly captures the mood and feel of Jaipur with its pink lime plaster walls that echo the old city and scores of scalloped Mughal arches, gold leaf frescoes and intricate Rajasthani art. Perhaps it is all down to the city’s magical location, sights and surroundings or the simple pleasure of winding down after a day of listening to legends, traipsing down storied alleyways, visiting ancient temples or wandering through gardens scented with incense, marigold and jasmine, but I have noticed one’s dreams tend to be especially vivid in Jaipur. A coincidence perhaps, but it feels only natural that one’s night should follow one’s day. 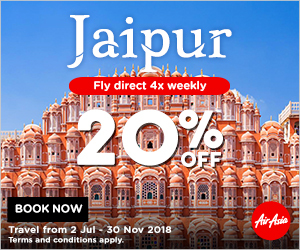 AirAsia flies to Jaipur from Kuala Lumpur every Monday, Wednesday, Friday and Saturday at 6.50pm. Return flights depart at 10.50pm on the same day.